If you’re still waiting to see Daniel Cormier defend the UFC heavyweight title against Brock Lesnar, don’t get your hopes up, company president Dana White says. ESPN reported last week that Cormier vs. Lesnar was being targeted for August. But UFC president White said at a seasonal press conference ahead of Saturday’s UFC 236 in Atlanta that Cormier may rematch Stipe Miocic before a bout against Lesnar comes to fruition. “That fight might not even happen first,” White said of Cormier vs. Lesnar. Cormier vs. Lesnar seemed to grow more likely just last weekend when Lesnar dropped the WWE Universal title to Seth Rollins at WrestleMania 35. 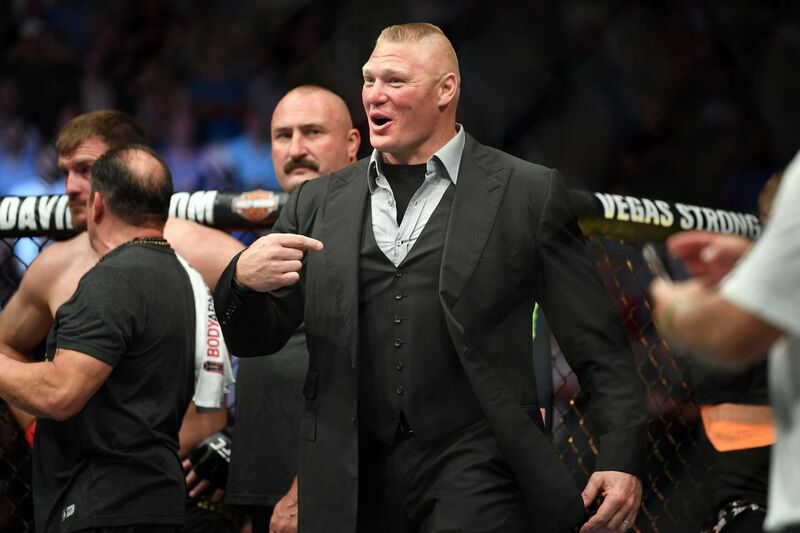 Many assumed this meant Lesnar was readying for a UFC return, but White said he has still yet to talk to the former UFC heavyweight titleholder. Cormier vs. Lesnar has been discussed for nearly a year. Cormier won the heavyweight title with a first-round knockout of Miocic last July at UFC 226. After the fight, Lesnar entered the Octagon and traded words with Cormier, nearly getting into a scuffle. Cormier defended the title for the first time against Derrick Lewis last November, submitting him in the second round of the UFC 230 main event. Since then, “DC” has been dealing with multiple injuries that have kept him sidelined. White said Cormier has to return to full health before his next title defense is booked. Cormier returned to the gym two weeks ago, he added. Lesnar last competed in MMA in July 2016 at UFC 200 when he met Mark Hunt. He initially beat Hunt by decision, but the result was overturned to a no contest after Lesnar failed a drug test for a banned substance.